Congratulations to LCCS Tennis on another incredible year! For the fourth year in a row our boys team won titles of District, Regional, and State Champions! On the district and regional level Xander Clark and Liam Wedge won boys doubles and Evan Schoeplein won boys singles. Also moving on to the state tournament: Luke Light and Luke Matheus – qualified in boys doubles, Allie Jones and Katrina Sharpe – qualified in girls doubles, and alternates Ronnie Richardson, Massimo Childress, Kyle Bland, and Josh Matheus. The TAPPS 3A State Tennis Tournament held in Waco brought another state title for LCCS! 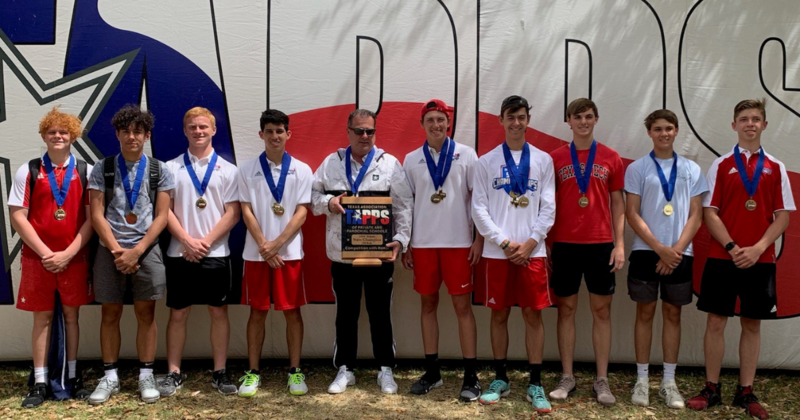 We won the TAPPS 3A State Boys Team Tennis Championship, Evan Schoeplein was the Boys Singles State Champion, and Xander Clark and Liam Wedge were Boys Doubles State Champions.